Did all your little ghosts and goblins have a good Halloween? Mine did, looking pretty cute I think, despite the constant rain. Lucky for me she's a lollipop girl and freely gives me her chocolate bounty. Pretty fancy she is. 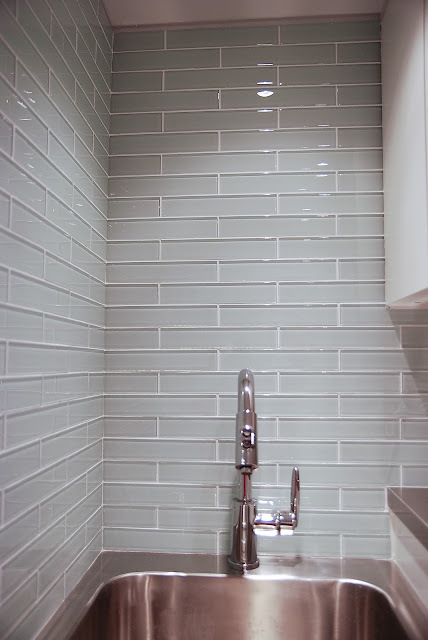 We just had to go with the elongated glass tile. We considered a few other options, but the glass tile just had the shininess and coloration we wanted for the laundry room. The tile is from Centura, a new-to-me local tile store (thanks Twitter folks for the suggestions!). They have a huge selection of glass tile in various sizes and colours. We went with the 2"x10" as it feels a bit more modern and the sizing worked out for us too. 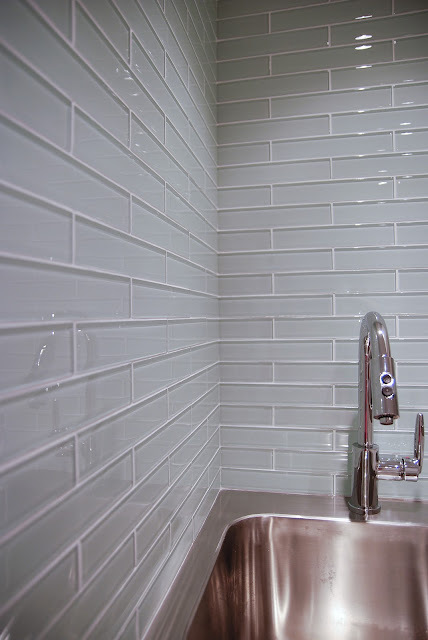 To make the modern glass feel more traditional, we installed it in a classic brick pattern. 1. Determine the critical tile. Typically, you'll want to have a full tile resting on your "bottom edge" (usually where the tile meets a countertop, or bathtub, or floor). 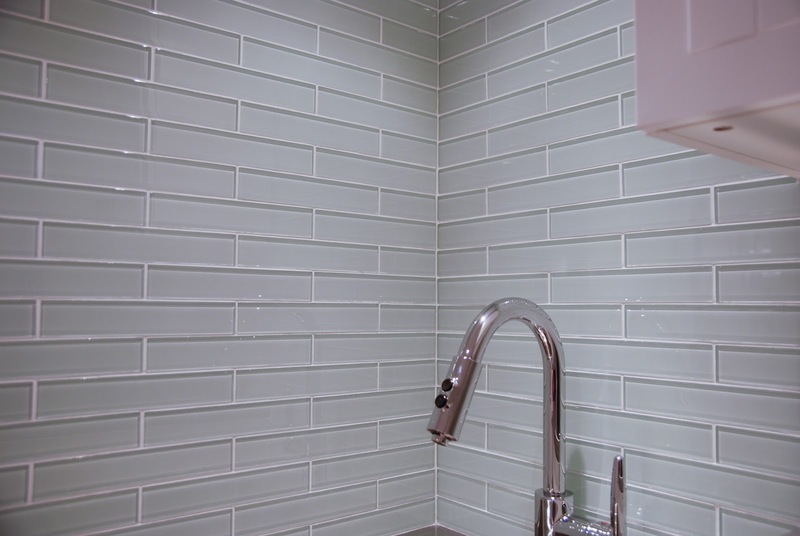 You will also want to leave space between your tile and the bottom edge for grout. In our room, there were actually two edges to consider: the lower sink countertop, and the higher countertop over the machines. We felt it was critical to have grout at the sink countertop (its a wet zone and the sink has a bit of flex and movement), but not critical to have grout at the machine countertop. So we set a tile on the countertop - what I'll call the "critical tile" and that determined the placement of all other tiles. 2. Check your cut edges. Once you've determined your critical tile, work away from that point and see how your spacing works out. 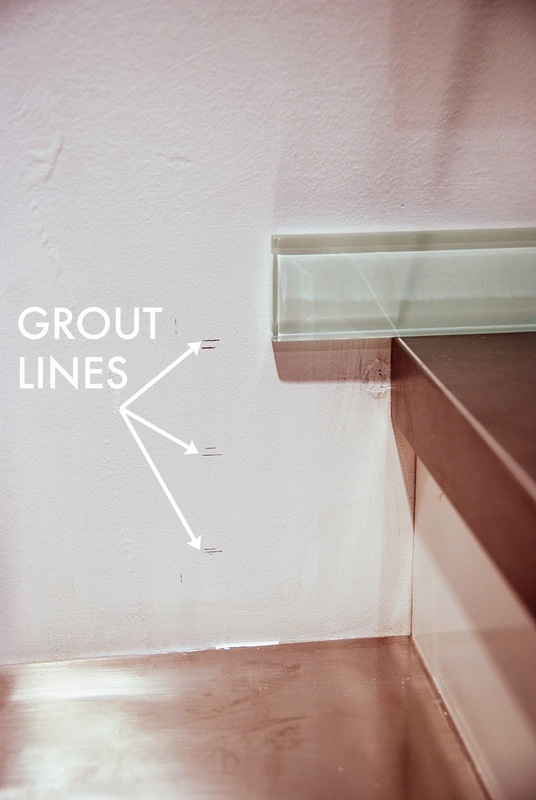 Mark out your space for grout and for tile. Its important to do this to see if you are left with any "extra" space. HandyMan found that he had room for three rows of tile and grout and about 1/2" of extra space before he hit the lower countertop. Knowing this, he was able to spread that 1/2" difference out across the three rows to make it not as noticeable. If you do your spacing and find that you are left with a sliver of a tile either at the top (near the ceiling) or bottom (near the countertop or floor), try and space it out to hide the difference. You don't want thin slivers of tile anywhere if you can help it. 3. 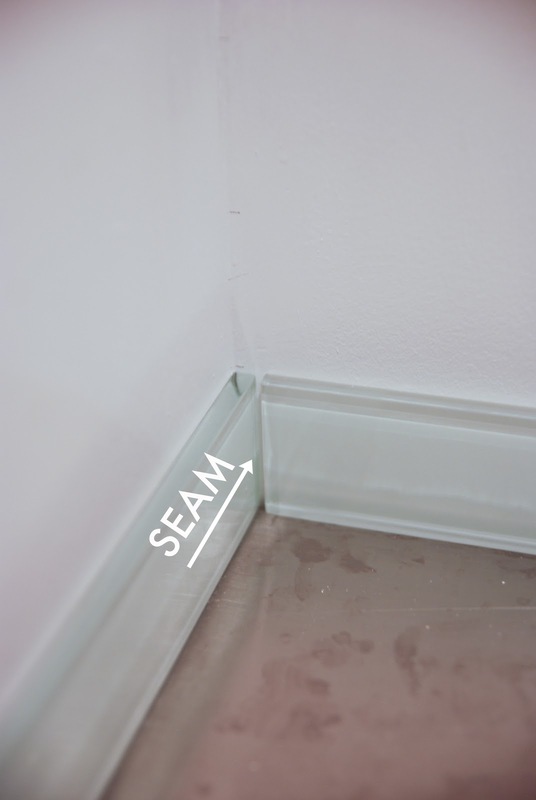 Determine which way your seams go. Of course, its best not to see the seam so you'll want to think about how you typically view the room. 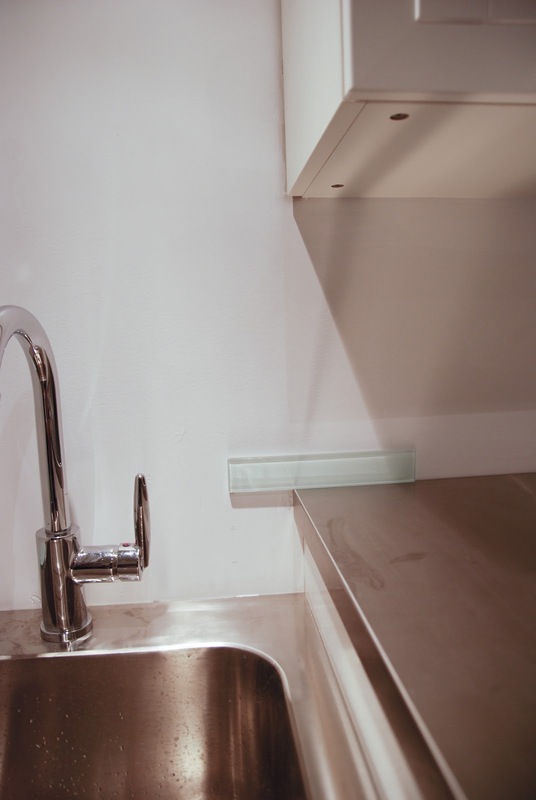 For us, we will typically be facing the sink so it made sense to hide the seam on the left wall. No seam visible from the front! the sink is the Numerar from IKEA. I love how extra deep this sink is - perfect for washing up paint brushes and messy toddler hands. However, the stainless steel itself is not a very thick gauge so I notice there is a bit of movement around our heavy duty faucet. Also, the sink does not come with a pre-drilled faucet hole. We searched everywhere for a large enough drill bit to cut that hole... and then weeks later discovered that IKEA actually sells the FIXA hole cutter for just that purpose. Of course they do! the faucet is the Delta Grail Single Handle Pull Down Faucet, courtesy of the fine folks at Masco Canada. 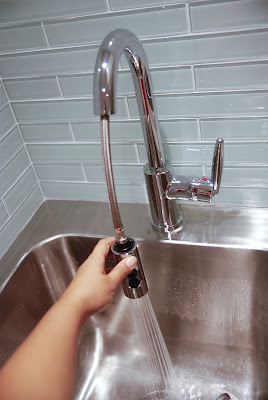 I LOVE LOVE LOVE this faucet - unfortunately, I think it has been discontinued though I have spotted some on Amazon. The faucet is nice and weighty and the high arc allows you to get things like a bucket easily down beneath it into the sink. The pull down feature is a must have, especially when paired with this deep sink. The pull down changes easily from a stream to a spray with a simple push of a button. Its so easy that Chloe can turn it on and use the pull down spray by herself now. And that is the laundry room backsplash and sink. We have a few more small bits to finish in here and a few surprises left to show you. Hopefully, we can give you a full laundry room reveal very soon! Countertop: Custom stainless steel countertop fabrication by Microtex Lab. Plywood substrate construction and countertop installation by us. This is absolutely great! 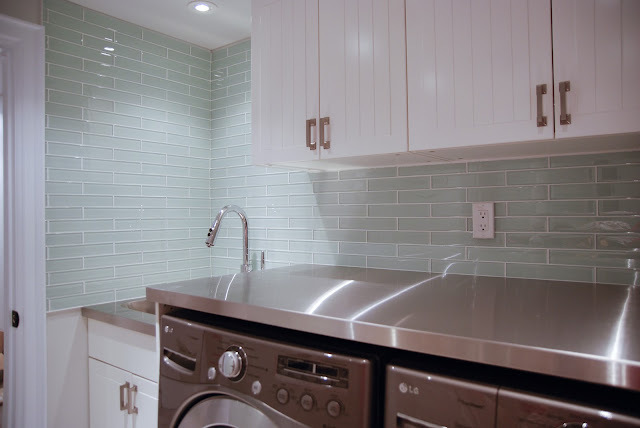 This glass tile backsplash adds beauty and neatness in this laundry room! Awesome! Oh, swooning over this tile. Seriously love it! Great pick. And Chloe is such a cute bumble bee!!! Absolutely beautiful sink, tap and tiling. I had a nightmare trying to install these glossy, glassy tiles and ended up spending a lot of money at uktoolcentre.co.uk trying to repair the damages I caused because I didn't buy decent equipment and materials to begin with. Lesson learned. The backsplash looks amazing, Jen, and thanks for the great tips! fantastic tile work and love all the tips! for sure will have to come back for reference on my next tile project. 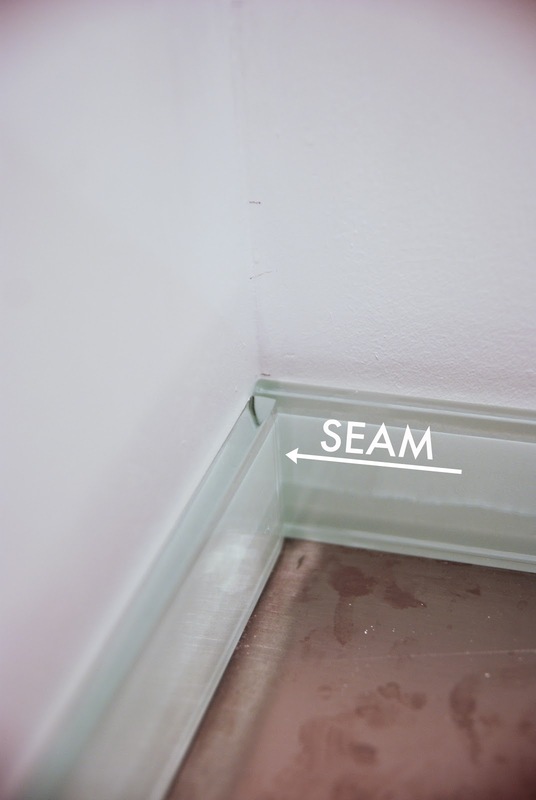 So true about the seams and about the spacing of the tiles. I relied on my contractor when he installed mine and advised me on how to avoid what he called the "mice tail" ==> thin sliver. That tile looks wonderful. Great job! Oh, I love that glass tile! It's so fresh and feels "clean" - perfect for the laundry room! Wow! I love your tile. Thanks for the tips about how to plan for set up - while I don't have any tiling plans currently these are good to know for future tiling adventures! Thanks Lisa! Tradesies, but you have to do my laundry too, m'kay? looks fabulous! 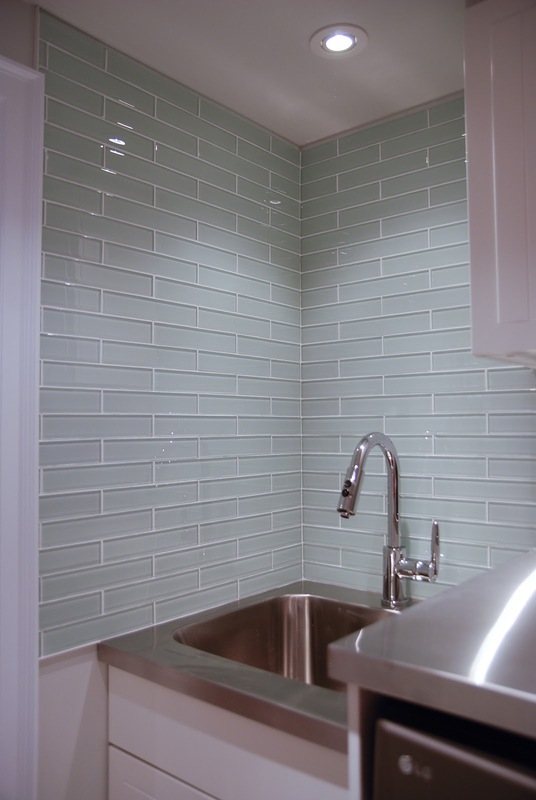 The color's so light and crisp, looks perfect against the stainless steel countertop :) Love it all! Funny enough, many a contractor has offered HandyMan a job as a tile setter, lol! It looks beautiful and thanks for the tips! We have some future tiling projects planned and I'm not sure I would have thought about these details. Pinning for sure! Good luck with the tiling. The prep work really does make all the difference. You have no idea how jealous I am of that room- it looks stunning and great tips!!! This laundry room is to die for! I love the backsplash and faucet!